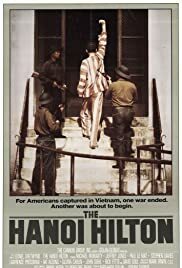 Hanoi Hilton is an excellent movie that captures the horror and the pain that American POWs had to face during the Vietnam War. It is NOT a political movie as some naive liberals would write in the comments section--nor is it right-wing grandstanding. The fact is that the Vietnamese people were downright horrible and tortured our men on a regular basis is historical fact. The fact that Jane Fonda, and other Hollywood idiot who would NEVER ever serve this great country (yet expect all the benefits American soldiers have given them)went to Nam and insulted the prisoners is an absolute fact. Those who write that this is a political movie are part of the problems with America--those who have never served, those who are too cowardice to serve, and those who spit on and insult the American soldier. Not one of them would have had the courage to withstand the torture and mayhem these brave men had to face each and every day. You should be saluting these men and not insulting them. These men are part of the reason you have MTV, HBO, NFL, freedom, the right to vote, etc--why America is free.